Though essentially a crime story — its centerpiece is an almost-silent 20-minute depiction of a museum heist — “Museo” is interested in much bigger issues. Alonso Ruizpalacios’ sophomore directing effort might be viewed as a study of disaffected young men in 1980s Mexico. Or it might be about a couple of idiots who get lucky in spite of their own ineptness. 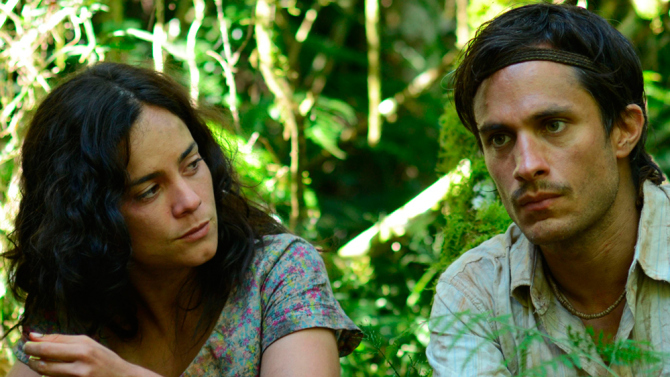 Juan (Gael Garcia Bernal) has a part time job at Mexico City’s National Museum of Anthropology. He’s helping a photographer catalog the museum’s collection of Mayan and Aztec artifacts, but Juan is always getting in trouble for handling these priceless objects without the requisite latex gloves. Though in his early ’30s, Juan is a boy/man whose lack of ambition — not to mention common sense — is the bane of his middle-class family. Early in the film he challenges his best friend, Wilson (Leonardo Ortizgris), to shoot a Rubik’s cube off his head with a bow and arrow. Wilson, who has the look of an uncomprehending bassett hound, at first protests this ill-conceived idea; then, at Juan’s urging, prepares to let loose a shaft. That scene tells us much about their friendship. Juan makes the policy; the loyal, thick-headed Wilson does his bidding. Which brings us to Juan’s hair-brained scheme to slip into the museum on Christmas Eve and sneak out with millions in ancient jewelry, stone sculptures and even an exquisite jade burial mask. As they did with 2015’s “Inside Out,” the animation geniuses at Pixar are again pushing the narrative envelope. With “Coco” they deliver a tale so dense with visual and thematic elements that by comparison most live-action films seem simplistic. Taking as it starting point the traditions and mythology of Mexico’s Day of the Dead celebration, the film emerges as an epic family drama that resolves with a deeply satisfying emotional coda. But as was the case with “Inside Out,” the film’s ambitions are so grandiose that it sometimes comes off as overwritten and unnecessarily complicated. Too many digressions threaten to derail the yarn. In a brilliant opening sequence that harkens back to the photo album introduction to Pixar’s “Up,” a family’s history is told in papel picado, the colorful hand-cut Mexican tissue flags. Our narrator, young Miguel (Anthony Gonzalez), relates how his great-great-great grandmother was abandoned by her musician husband, leaving her to raise her daughter Coco alone. (Coco is still alive, an ancient creature lost in silent dementia and cared for by her extended family.) Nevertheless she established a family-run shoemaking enterprise which endures to this day. She also banned music from her household. This poses a real problem for Miguel, who loves music, plays it in secret, and worships the memory of Ernesto de la Cruz (voiced by Benjamin Bratt), a legendary guitar-strumming troubadour from the 1930s who starred in a series of perennially popular black-and-white movies. In fact, Miguel comes to believe that Ernesto de la Cruz — who died years earlier in an on-stage accident — is his great-great-great grandfather, about whom no one in the family will reveal anything. A fermented mashup of spaghetti Western imagery and art house pretensions, “Ardor” gives us Mexican star Gael Garcia Bernal as…well, as Charles Bronson. We first seen Bernal rising from a jungle river deep in the Argentine interior…he looks like some sort of primordial spirit. Actually, he’s a farmer named Kai who has survived the burning of his homestead and the murder of his family by gun-toting goons. Kai stumbles barefoot and shirtless to the farm of Jao (Chico Diaz) an old man scratching out a living with his daughter Vania (Alice Braga). But trouble follows in the form of three murderous brothers who force Jao to sign over his property and then kill him. They take Vania as their prisoner. Her new duties include cooking for and washing the clothing of her owners — and that’s just during daylight hours. Happily Kai comes to the rescue, leading to a bout of jungle love (doesn’t look very comfortable) and a vendetta against the three killers and other mercenaries who have been making life miserable for the poor, hard-working farmers. Ideologues usually occupy an irony-free zone. How ironic, then, that “Rosewater,” the true tale of a Western journalist caught in the Kafkaesque world of Iranian justice, was made by one of America’s funniest men — “The Daily Show’s” Jon Stewart. In 2009 Newsweek sent London-based Maziar Bahari to his native Iran to cover that country’s presidential election. The stories he filed provided a sympathetic look at young activists opposing the repressive religious regime. Then he upped the ante by daring to suggest that the election was rigged in favor of hard-liner Mahmoud Ahmadinejad. Soon thereafter Bahari was pulled from his bed by police, charged with espionage and forced to endure four months of interrogation that ranged from the rigorous to the ridiculous. A key piece of the prosecution’s evidence was an interview Bahari gave to an American television show. Comedy Central’s “The Daily Show,” to be precise. The “interview” was a typical example of that program’s satiric skewering — only the Iranian authorities failed to recognize it as comedy. At least part of Stewart’s motivation in taking a summer off from his TV career and making his feature writing/directing debut was his regret that “The Daily Show” contributed to Bahari’s ordeal. But this subject matter also dovetails nicely with Stewart’s longstanding disdain for absolutism and dogmatism, both of which are in plentiful supply in Iran. 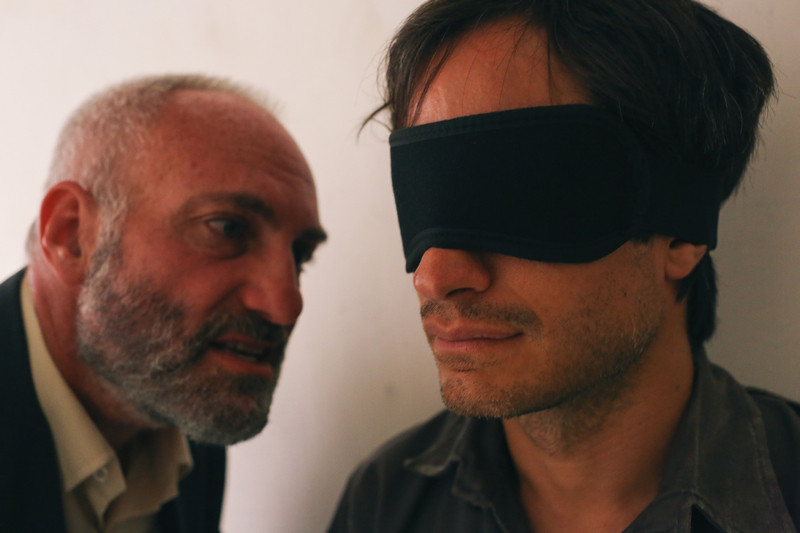 At “Rosewater’s” core is the conflict between rigid authority and nose-tweaking resistance.